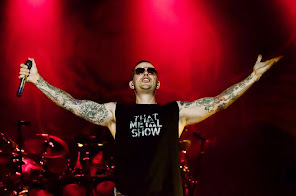 Avenged Sevenfold's M.Shadows tells to The Pulse of Radio: "The DVD will take place right before we lose Jimmy, and then it's gonna basically take you all the way through to now." "So it'll be mixed in with some live performances, but there will also be a very strong story arc to what our story is and what's going on with us." "It’s basically tracking the whole thing through our own eyes and words, because no one has really heard our side of the story. Other people have just talked about it themselves. We’ve always been pretty private about it. So now people are going to get to see visually what we went through." The DVD will include live videos from the band's sets at Download, Rock In Rio, Rock On The Range and more.